I’ve been riding dirt bikes for over 20 years now so I’ve learned a thing or two along the way that I can share with you that will help you gain more enjoyment from this awesome sport & lifestyle. I’ve made a lot of mistakes throughout this time and often had to learn my lessons the hard way, like when my very first MX bike – a 1991 RM 80 – seized the day after I bought it with all of my hard earned savings. If I had known what I know now (or had someone with me that knew) that would never have happened. Since then I’ve owned a number of motocross bikes which I’ve learned how to carry out the maintenance on myself, as I haven’t always been able to afford to just take it to the mechanics. And I’ve always been very meticulous with my maintenance procedures too. In terms of my riding level..? I’m no pro. But I’m a confident, fit rider and I derive a lot of enjoyment from it. And what I can honestly share with you are some basic, fundamental techniques and tips that I’ve been taught along the way that have helped me improve my riding skills immensely. And what I found is that once I made a real, conscious effort to implement these techniques, and combined that with a well maintained bike, my riding improved in leaps and bounds. If You Are a Beginner Rider, The Dirt Bike Garage Manual Will Show You How To Ride Faster & More Safely, Easily Carry Out Money Saving Repairs On Your Bike, And Train From The Comfort Of Your Own Home To Become Seriously Bike-Fit So You Can Out-Ride Your Mates! Have a think about this for a minute.. Would you like to..
Increase the level of enjoyment you get from riding? Have more confidence when riding, especially around others? Learn some specific dirt bike related exercises that will not only get you fit, ripped and strong but will help you ride faster, ride for longer AND ride more safely than you currently can? Be able to quickly adjust your suspension to suit the terrain you’re riding on for any given day? Be able to ride over more challenging terrain? Learn how to keep your bike not only looking mint, but operating properly like a new bike? Know how you can save a heap of money by being able to carry out a lot of the ‘mundane’ repairs and maintenance on your bike? And impress your mates with your know how skills! Learn how to avoid buying a dud second hand dirt bike and at the same time learn how to get the highest possible resale value for your bike when it comes time to sell? If you answered YES to one or more of the above questions then The Garage Manual is for you. Hi Hayden, This is such a cool book! I will highly recommend it to our Hauraki Plains College MotoX team – bed time reading! I absolutely love your book and can see what a benefit it would be for our kids, I was going to look into the cost of printing off 30, would I need to buy 30 copies from you to print them off. I don’t want to be up for any copyright issues. NOW OVER 1000 COPIES PURCHASED BY SATISFIED CUSTOMERS! The Dirt Bike Garage Manual is an eBook which is a pdf download NOT a hard copy book. Once downloaded it can be easily printed and binded (at your own expense). The Dirt Bike Garage Manual offers a combination of well presented, existing pages from Dirt Bike Tips & Pics.com, plus exclusive bonus material that can’t be found on the site. The main difference being you can download and print it off to make your very own Dirt Bike “How To” Book. A 65 page practical manual that you can take to the motocross track or leave in your garage. Why Are You Wasting Money On Crap That Doesn’t Improve Your Bike Skills?? Too many people throw crazy amounts of cash at blinging up their bike before investing in themselves. You know what I’m talking about, guys who spend hundreds of $$ dollars on upgrading their exhaust system, slapping on the latest graphics and only riding in the newest gear. That’s cool if you can ride well but if you’re not that flash on a bike you should spend some money on getting your technique right and learning a few tricks of the trade in the garage. The benefits are huge..
A well executed wheelie is always a crowd pleaser! And as you can see in this vid, they’re wicked fun. Follow the tips in this book, practice and you can do ’em too. Thnx bro! I got the link and successfully downloaded it. I really appreciate all the time and effort you put into making sure I was happy! – Gregg. Grab your pdf copy here and receive my BONUS video containing specific home workout exercises that many riders use to relieve arm pump! I learned these exercises from a professional MX trainer and have used them to massively improve my endurance. Using The Dirt Bike Garage Manual you’ll be able to follow the step by step instructions (with photos) next time you’re attempting to repair your donk. Or you can refer to the riding tips section between bashing trails and tracks to keep your mind on what you should be doing. Throw it in your ute, workshop, desk or backpack.. it’ll go anywhere you do. You’ll find the guts of the book will contain.. The basic, but fundamental riding techniques that the good guys use. Here are a few other helpful things you can expect to find in the Dirt Bike Garage Manual. Tips on what to look for when buying a used dirt bike. Print it off and take it with you when buying your first or next second hand bike. It also includes bonus tips on how to get the best resale price when selling. How to build MX tracks. The fundamentals of getting it right without without wasting unnecessary hours and money. A suspension clickers chart specifically designed to help you record the settings enabling you to find the best combination for your riding style and preferences. Maintenance charts to keep you on top of necessary repairs and general services to get the most out of your bike. Some very cool, full size desktop background images for your PC. 3 Killer Workout Programs You Can Do At Home That Will Get You Seriously Bike-Fit Within 60 Days! Included are these bike-specific fitness training programs complete with videos that you can use to improve your strength, stamina, reflexes, general well being and therefore overall riding ability. Written by my close friend Peter Bristow from B3 Training – He has been a self employed personal trainer for over 10 years and knows how to transform bodies with solid results. These programs alone are worth more than the price of this book! There’s loads of great stuff crammed into this book that can save you money, wasted time and stress.. and in the process help you become a better all-round rider. I’ve put everything I could think of into this with the aim of providing beginner to intermediate riders something that will help you progress in this exciting sport. I don’t really do the ‘hype’ stuff so I’m not going to prattle on about how this will teach you to ride like Kevin Windham (cause it won’t!) or prep your bike like the Rockstar Makita Suzuki Team mechanics. Instead I’ll offer you a 60 day MONEY BACK GUARANTEE.If you don’t like it or you honestly don’t think it has helped you, I’ll give your money back, no problems, no questions asked, and you can keep the book anyway. Nice work on the book Hayden. My son will love it. I just wish there had of been something like this around when I started riding. Your suspension settings are critical as to how well you are able to ride, yet 95% of novice riders don’t learn how to adjust it to suit their body weight and/or the terrain they are riding on. If you only learn this one thing – how to dial in your suspension – you will be thankful you bought this book! Most newby riders will happily spend $45 on a new riding shirt or cap. But for less than the price of your next oil change or a few cups of coffee you can easily access all of the valuable tips from Dirt Bike Tips & Pics when you’re next out of the house or office. The Garage Manual can be purchased from this page through secure PayPal or Credit Card for $14.95. Grab your pdf copy here and receive my BONUS video containing specific home workout exercises that many riders use to relieve arm pump! I learned these exercises from a professional MX trainer and have used them to massively improve my endurance! Click below on the Buy Now icon to have it emailed to you within minutes! The Garage Manual is awsum as!! Has heaps of stuff in it to read, I like the riding tips and the fitness programs. Thanx Hayden. Here is a list of chapters and pages included in The Garage Manual so you know exactly what you are getting..
– Which Dirt Bike Should I Buy? This is great thanks! Lot’s of handy information and things to learn which should keep me busy for a while! I particularly like the MX screensaver too. If you aren’t comfortable or familiar with all of the above.. you’re short changing yourself. Knowing and applying these things will make a real difference to your riding, bank account and enjoyment. Grab yourself a copy and print it off. Sneak it out on your office printer (select double sided page option), or take it to your local printers and bind it together for the complete Dirt Bike Garage Manual. The Garage Manual is a pdf document. Check your spam folder and inbox for the email download link after purchase. It may take 1 – 2 hours for the email to reach you. 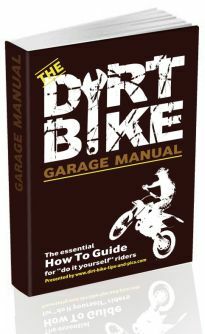 If you’ve enjoyed Dirt Bike Tips & Pics and got a lot out of it – please show your support by purchasing The Garage Manual. Websites like this take a LOT of work to set up and the information is free, so I’ll leave it to you to make the call but just know that I truly appreciate each and every person that makes a purchase. The Garage Manual is a result of years of riding experience, hundreds of hours of labour and a desire to help other riders with their ‘dirt bike journey’. And there’s nothing around like it! Enjoy, and remember.. the journey is half the fun! Remember if you purchase your pdf copy you also receive my BONUS video containing specific home workout exercises that many riders use to relieve arm pump. I learned these exercises from a professional MX trainer and have used them to massively improve my endurance. Pdf version only $14.95 – Click on the Buy Now icon to have it emailed within minutes!